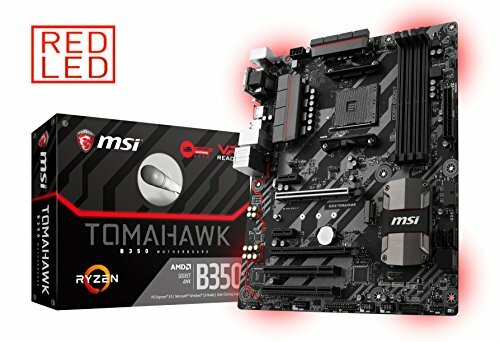 B350 motherboards are the answer for the budget restricted people packing a strong value punch for your Ryzen’s first and second generation (2nd gen support enabled with a B.I.O.S update) processors. 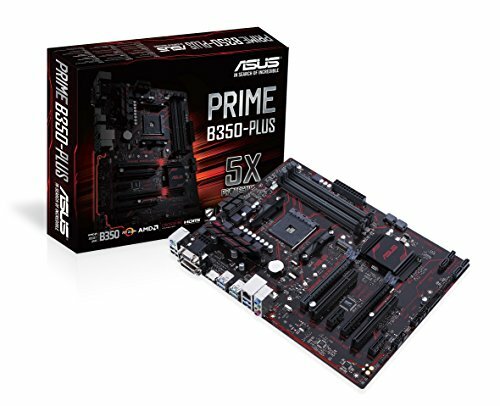 The B350 motherboards aren’t exactly cheaply made and they do not fall behind your high-expectations either, they come armed with all the up-to-date components to complement the Ryzen 1 and Ryzen 2 processors well. Make sure to check each board’s QVL list for its RAM compatibility before making a purchase because Ryzen boards are pretty picky when it comes to RAMs. Which brings our curious readers to the right place for them to scour through some of the best motherboards for their Ryzen processors within their reach. Let us proceed! Our list is again opened by the ASUS motherboard with its ever-green excellency catering to all your basic needs out of a gaming build with its elegant design and aggressive heat-sinks. The reinforced PCIe slots are both running at 3.0 x 16 which is good to have as B350 boards are paving the way for multi-GPU configuration (up to 3-way CrossFire). I/O of this board is richly supplied with a plethora of USB ports from Gen 1 to 2. It doesn’t come with an inbuilt WiFi. In terms of storage options, it has SATA and one NVMe M.2 drive placed cleverly on top of expansion slots to avoid the heat from GPU. This board supports up to 64 GBs across all four DDR4 DIMM slots with speeds up to 3200 MHz. The set up of fan headers is pretty standard with 3 case fan headers and 2 CPU headers. You’ll also get AURA Sync RGB lighting plus additional 4-pin RGB headers provide a nearly endless spectrum of colors with the ability to synchronize effects across an ever-expanding ecosystem of AURA Sync enabled products. As far as its audio system is concerned, it comprises an industry-leading 8-channel HD audio with the ROG exclusive SupremeFX S1220 driven by Japanese capacitors. ASUS is notorious for its functional and easy-to-use BIOS implementing custom fan curves for different temperature sources to dialing in CPU and RAM overclocks. Of note, Ryzen’s APUs will require a BIOS update for this board, you’ll need an older AMD chip to update it or find a board already updated, in that context, it is compatible with new AMD Ryzen 3 2200G and Ryzen 5 2400G. Delightfully, it can also run Ryzen 200 series on it, you can confirm it from the silver sticker on the boxing. In a summary, you are guaranteed to get the most bang for your buck from this elegant all-inclusive board. Let us throw one more value board at you to bring a smile to your face, meet MSI’s Gaming tomahawk. Runs all too well with Ryzen 3, 5 or 7 systems harnessing maximal capabilities at a reasonable price range. It wields steel armor PCIe slots, NVMe M.2, 4+2 phase power covered with same primary MOSFETs as the B370 boards, and USB 3.1 Gen 1. It has 4 dual-channel DDR4 RAM slots supporting up to 64 GB running safely at 3200 MHz. As per MSI’s norm, they’ve added the MSI GAMING tools. Clever hardware and software tools to assist you while gaming. It comes with CrossFire support for its PCIe 2.0 x 4 slot. You can customize and set up your own color scheme with RGB Mystic Light Sync. Select any of the colors from the palette using your smartphone or the MSI Gaming App to match your system style. Bios overclocking is simple and provides you with all the options to get the job done. For those troubled by the endless sand-dune of BIOS compatibility issues, we advise you to get the latest BIOS version 7A34v15 as a permanent remedy. Audio-wise, it has Realtek ALC 892 audio codec with high-quality capacitors. We really enjoy the audio boost built into this motherboard and being able to plug in our Razer Tiamat 7.1 headphones without having to spend more money on a quality sound card. MSI also includes MSI control center which makes overclocking from the desktop a breeze as well as keeping an eye on temps and timings. You can run your CPU at 3.7Ghz with no adjustment to vcore and everything set to auto. There have been rumors going around about disabling SMT in the bios, we advise you otherwise, do not disable it on this board or you will end up in an endless boot loop and be forced to pull the battery from the board to clear the CMOS. The four CPUs that we would recommend you running on this board are Ryzen 3 1200, Ryzen 5 1400, Ryzen 5 1600 and Ryzen 7 1700. All of these should run at 3.7 GHz fixed on all the cores without a problem. Lastly, make sure you download the latest AM4 drivers from AMD and directly register your motherboard at MSI to activate the board’s warranty. 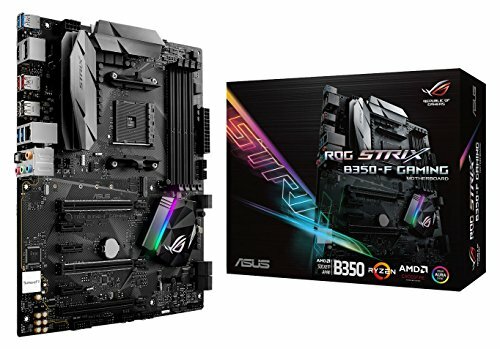 The solid grip of ASUS over the motherboard market speaks loudly again with two of its boards making to our list. This one rests at a more lower price range compared to the previous board, but, does this even hold well at such low pricing? Let’s find out. It comes with reinforced one-and-only x16 PCIe slot which means you cannot enjoy multi GPU configuration seen from the previous board. The M.2 slot is placed really well to draw in a decent airflow like the previous board. It comes with USB 3.0, 3.1 and 2 ports. It supports 4 DDR4 DIMM slots up to speeds of 2666 MHz with a max capacity of 64 GB. If you have an AMD A-Series processor you can have integrated video, but if you have an AMD Ryzen processor, you need a dedicated GPU (Video Card). Just above the CPU socket, you’ll find two of the only three 4 pin PWM fan headers. The last one placed beside RGB header stationed for Wraith LED cooler. FanXpert 2+ delivers advanced fan controls for optimized cooling and specially designed fan RGB header to support multi-color CPU fan LED strip. The manufacturers are regularly updating the BIOS of this board by updating it time to time. The overclocking is pretty easy with DOCP profiles so you can basically pick the profile that comes on your RAM similar to XMP and run it at its stated frequency, this easy overclocking of the RAM is very important for your Ryzen builds. We’ve managed to overclock Ryzen 100 series processors to 3.8 GHz without a hitch. Taking a look at the audio section, it has a small LED split PCB which uses an ALC887 chip from Realtek and a total of 4 full-sized capacitors as opposed to the 10 clusters seen in high-end boards which is not too bad but certainly not the over-the-top stuff. Overall, it is a fantastic motherboard with a very reasonable price point with few budget cut-offs for audio, cable management, and styling option but they are fairly meager concerns in contrast to the overall performance per price value. 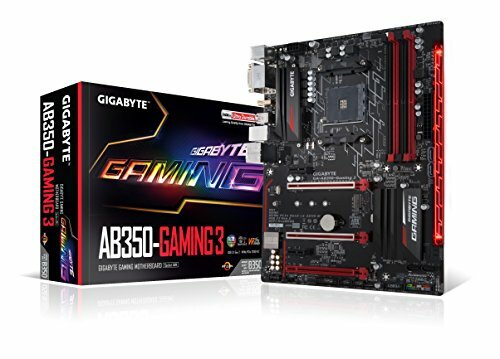 4th entry in the list is from GIGABYTE’s wide array of motherboards available in different designs, we picked the AB350 Gaming 3 for our review. This is a good value investment stationing, two USB 2.0 headers, a USB 3.0 and 3.1 slots, M.2 NVMe slot, and steel reinforced dual-PCIe x16 slots. It does have a good power delivery system with only one heatsink on the left side for modest overclocking giving you a stable 3.7 GHz on all the cores. It has 4 dual-channel DDR4 slots supporting up to 64 GB at 3200 MHz. Its audio features Realtek ALC 1220 audio chip on it which is pretty solid for this board. If you like RGB then you’ve come to the right place, GIGABYTE’s RGB Fusion is probably the best RGB available on the market featuring multi-zone LED light show design which displays 16.8M colors, 2 programmable sections, 7 different lighting effects, 2 RGB lights strip pin headers, accent LED with interchangeable overlay, and advanced mode for extreme customizability. All of this right under your control with RGB fusion’s mobile app. Its cooling system also holds a lofty set of features with Smart Fan 5 exhibiting 5 fan/water pump connectors, 6 temperature sensors, fan pin headers upgraded to hybrid fan headers, and inter-operable fans and sensors. It comes with an updated BIOS supporting boot option for NVMe M.2 SSD. Lastly, this board is Ryzen 2000 ready with the required BIOS update available. To conclude, this is a sound investment coming at a digestible price for the folks looking to get an above average performance from the board. Last board only the list is ASRock sealing the deal with this basic looking board which hits all the right spots for buyers seeking a middle-ranged board with decent overclocking prowess. It is loaded with two M.2 slots (one of them is NVMe) which is very impressive for a board at this price tag. Two PCIe 3.0 slots and super alloy 6-phase power delivery components with dual heatsinks and has a 3-phase SMC/GPU portion if you’re using APU. Moving onto the RAMs, it has 4 dual-channel DDR4 slots supporting up to 64 GB which runs at 2667/2400/2133 MHz. A unique perk associated with this board, it supports triple monitor for video outputs. Its audio set up features Realtek ALC892 7.1-Channel High Definition Audio codec and ALNA audio cast, which are higher quality audio capacitors to enhance the audio quality. There is one 4-pin CPU fan header, three 4-pin chassis fan headers, and two RGB headers. ASRock has also stationed a beefy heatsink for the chipset which easily conspicuous from at first glance. It has a pretty straightforward BIOS without any easy mode or other special modes like MSI or ASUS boards, nevertheless, it gives you adequate and stable overclocking at fairly lower voltages. There is an updated BIOS for Ryzen 2000 series available, this allowed us to easily adjust the RAM speed. This motherboard boots from the M.2 and is also able to boot from the spinning HDD in BIOS compatibility mode right out of the box. You will have to clear the CMOS (2.0) everytime an overclock fails after updating the UEFI, so, you are advised to use Ryzen Master to overclock and test before actually changing anything in the BIOS. Windows 7 and the Zen platform are officially incompatible. So, you would be much better off running Windows 10 with a Zen-based CPU. 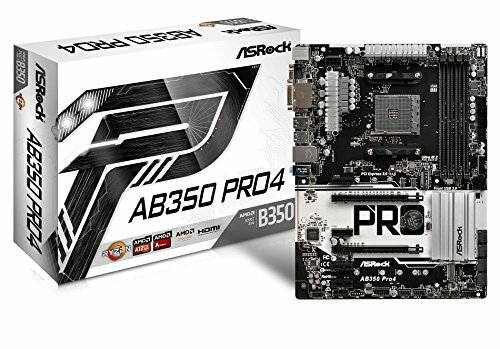 It’s safe to assume that ASRock has adopted the path of simplicity while making this board by trimming down all the bamboozling extra options into the BIOS or software of the board and kept it to the actually useful and needed features. Hence, you can have it at an extremely heartening price tag.